We want you to introduce a different and easy style of knitting, which will may be a innovation for you. In this video you can see and make new design of your cushion made by ohhio braid, nowadays it is very popular around the world, so you can buy it everywhere, in every supermarket. This way of knit is extraordinary, because you make it without anything, just by your hands, using ohhio braid. It will be interesting as for them who has had experience in knitting as for beginners, so don’t waste your time and start it right now. This style of knitting does not take much time and it is easy to do. If you are tired of traditional ways of knitting and want to try something new, this style is exactly for you. 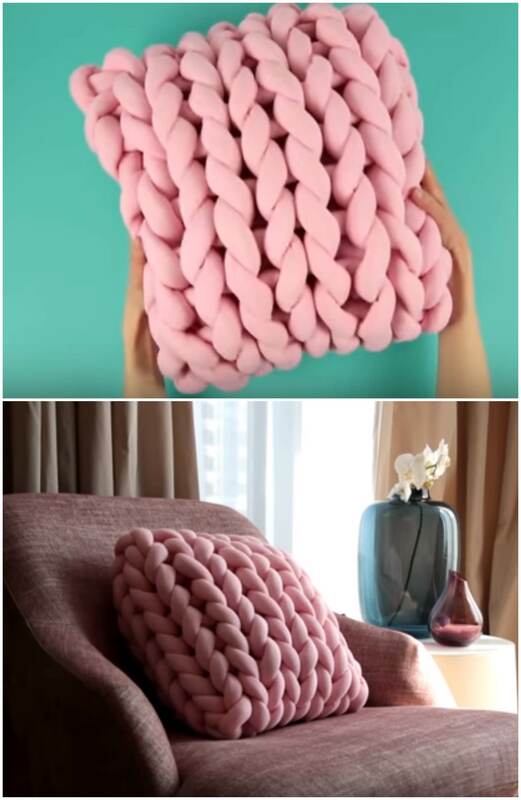 In this video it is clearly explain how to knit your cushion like this, we think that this is a great decision for your home decor, you can use it everywhere in you home, on the sofa, in the bedroom, in the children’s room and etc, on the other hand this kind of cushion is very modern and comfortable. The style of knitting is universal, so you can knit anything you like by your hands. In this tutorial it is shown how to make this cushion in this style, but you can try to make different things by using this style. Thanks to the author for this lovely tutorial. In the future we are going to share with you the other tutorials of knitting in this style. wish you good luck!